It's a bit old story now, as this double pack CD was released at the turn of November / December 2009, but somehow I did not have time / mood to post it so far, but I still wanted to mention this album on my blog as I've listened to this a lot recently. 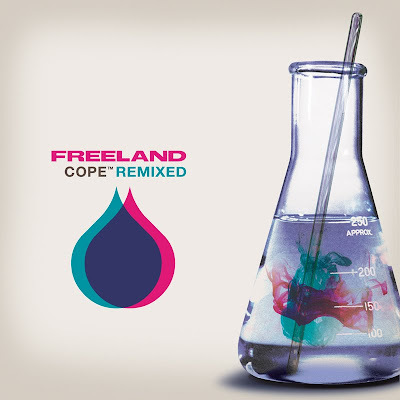 The remixes of the highly acclaimed Freeland's Cope present a smashing selection of diverse beats by top-notch artists in the heavy bass or techno game. What is more - the best remix IMHO, i.e. Strange Things by High Rankin can be downloaded for free!! On both CD's the first few tracks are my personal best. Apart from High Rankin super heavy roller on the first CD, Siriusmo (BoysNoize Records and Monkeytown Records) from Berlin in a quite restrained (for him) manner turns Rock On into nice and calm electro joint with interesting melody line. Zombie Nation from Munich successfully applies lots of lazers and drums, whereas UK-based Shadow Dancer drops a dancefloor bomb in the best of 2-Many DJ's styleee. Moving on, Brazilian, Gui Boratto builds minimal sonic textures creating the space typical for Cologne's Kompakt community and although I don't listen much to minimal techno any more, I still regularly play Kompakt stuff. I have so many great memories associated with Cologne as I spent 2 years there back in the 90's at the very peak of techno era and was buying lots of music by Juergen Pappe, The Modernist, Michael Mayer, Pentax, Reinhard Voigt and many others. Gui Boratto brings back all these memories with melancholic force. The second CD starts from a slow but heavy dubstep remix of Rock On by Emalkay, with wobbly, talking bassline built around infectious vocals of the original. The man of the year - Joker uses again his famous purple wow neon synths of which I can never have enough. One of the best remixes in the pack. Then, IDM king Nosaj Thing steps up to deliver a short but very emotional, tight and twisted electronic journey full of delays, cut up vocals and heart-breaking loops. I love music produced by Jason Chung - he never falters, never fails and he attunes so well with my neural structure as hardly any other artist out there. PANTyRAiD offers their trademark wobbles and wide instrumentarium, whereas Dub-Tech star from Romania - TRG packs future garage beats into a soft groovy stomper. More Kompakt follows with Justus Kohncke and AC Slater, as usual, murders the public with heavy, pumping banger. A bit too repetitious and with silly beat, but don't all dancefloor smashers have such characteristic? The last remix worth mentioning is My Faust's electro-rocky refix of Strange Things, reminding me of Justice. The entire release is not very consistent music-wise, but you know what - this is exactly what I like about Cope Remixed. I'm really fed up with releases including 10 remixes of the same track only slightly varying between themselves. Besides, I'd always rather face creative and surprising chaos where I can choose something for me than solid but boring and predictable stuff (if you know what I mean, ich don't think so).